The New York Excelsior is the best Overwatch team in the world. 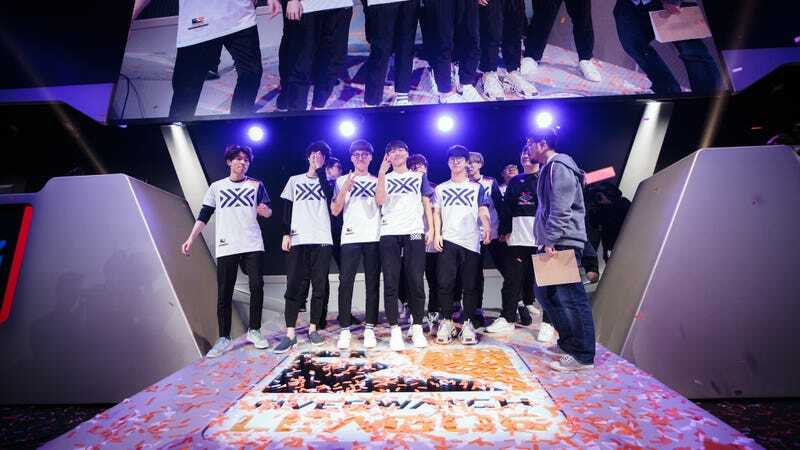 Despite an always-shifting metagame and one of its best players sitting out nearly a third of the season so far, they’ve won two Overwatch League stages and made the playoffs for the third. They rarely drop games and have swept every team in the league at least once. How? Compete spoke with the NYXL coaching staff in attempt to answer that question. Assistant coach Kim “WizardHyeong” Hyeong-seok translated our questions and his colleagues’ answers in a conversation over Discord voice chat. New York’s playstyle is, broadly, defensive, a word the coaches of New York used often when discussing their mindset and strategy. The most common Overwatch lineup consists of two tanks, two DPS (damage per second, or simply, damage dealers), and two supports (healers). The tanks and some of the DPS players lead the way while getting backed up by longer-ranged DPS heroes and the supports, whose low health and high value means they need to stay safe. When teams get into a skirmish, these six members react in different ways. In a dive composition, the tanks and DPS on the front line go straight for the enemy’s back line, “diving” in to pick off high-value targets. It’s a strategy that asks a lot of the supports, who have to back up the divers while not succumbing to enemy fire. New York’s defensive style is somewhat the opposite: the tanks, instead of diving for enemy targets, try to enable New York’s backline to do what it does best. Though the coaches tell me they work on other, more aggressive styles, being hyper-defensive is the bedrock of their strategy. Kim says that their style is often copied but usually misunderstood. Like any well-run sports team, the plan is centered around the talents of their best players—especially Bang “JJoNak” Seong-hyun. Bang is the fiercest Zenyatta in the game, a role he’s basically created for himself. The timid support, a floating robot-monk who throws orbs to disrupt the enemy, doesn’t seem intimidating, but Bang racks up the eliminations with a hail of perfectly aimed metallic balls. The coaches say that Bang creates a perfect anchor for a stout back line. And the rest of their personnel make that defense almost impenetrable. “I don’t think other teams would have a defensive Mercy who could pull out that defensive stye like Ark does,” said Kim. “Or they don’t have as good defensive D.va as Meko, who can pull out that good of a defensive style.” As Kim explains, unleashing Bang enables Hong “ArK” Yeon-jun, their regular Mercy player, to play comfortably. Where Bang pops off, Hong hangs back, keeping watch over the team and controlling the fight. You can see this support synergy play out in a match against the Houston Outlaws from stage 2, where Houston’s Winston player Muma tries to dive onto Bang and take him out of the fight, only to find Hong there to stave him off while still positioning his Ana to keep tallies on the rest of the team. These two set up the rest of the squad in ways that are simply not available to other teams, because of the incredible synergy between them. Bang presents a threat as deadly as a Widowmaker, and Hong heals and covers enough for two players’ worth. They can more reliably resurrect their DPS players than just about anyone, and as we’ve covered, Bang’s ability to pick off important heroes on the other team is basically unmatched. All this forces diving opponents to overreach; and like in any fight, the opponent sets themselves up for a world of hurt when they do that. Take the flank that Kim “Pine” Do-hyeon executed on the Houston Outlaws in April. When Pine’s Widowmaker starts shredding the back line, Winston and D.va are too caught up dealing with the other five members of the Excelsior to retreat and protect them. The Outlaws’ back line is too far from its tanks, the big beefy heroes who can get between a sniper and its prey. Pine is essentially shooting fish in a barrel, Houston’s tanks are nowhere nearby, and their defense has been split and dealt with in just a few moments. It’s easier to lead the push with such a strong defense, but that goes the other way too. The big boss Pine is a seasoned master with Widowmaker’s rifle. Park “Saebyeolbe” Jong-ryeol ushered in the “married man meta” with both his endearing love for his wife and his incredible Tracer play. Kim “Libero” Hae-seong is one of the best players in the league on projectile-based heroes like Junkrat and Pharah, and Jung “Anamo” Tae-sung was a key mid-season signing at support. It’s a great roster! That depth gives the NYXL some flexibility to plan for their opponents. Against a team like Houston with a strong Widowmaker, Pine is a better fit, but Libero’s mastery of shield-battering projectiles will serve better than a pinpoint sniper against teams that like to go shields up like Dallas or the LA Gladiators. It’s little surprise this team plays so well together. Most of the team, both players and coaches alike, hails from Luxury Watch Blue, one of the sister squads that played in the South Korean Overwatch scene. Saebyeolbe, Meko, Janus, Pine, Mano, and JJoNak were all part of the Blue squad, coached by Yu and Kim. While other members come from other backgrounds, the core group was picked up wholesale due to the success they were already seeing overseas. NYXL staff told The Ringer in January that New York’s owners determined the best path to be signing players who were already winning. Members of the future NYXL walk out as members of Team South Korea at the 2017 Overwatch World Cup. Kim says that “you look at other teams, and I see a lot of unhappy players. And I’m kinda wondering how it would be possible for them to play a high level if they’re not happy.” The NYXL players work hard, sure, but they also let Pine take a break that was explicitly for mental health reasons, and Saebyeolbe lives in an off-campus apartment with his wife. The team took a week completely off between stages 3 and 4, when most teams were likely practicing for the coming Brigitte-laden meta, which could have become a stumbling block. But that long vacation hasn’t seemed like it’s affected them at all: they’re 5-1 in the stage, their only loss a narrow 3-2 to a surging Los Angeles Valiant. As head coach for New York now, Yu focuses on the macro perspective. He looks for the overall picture, determining compositions (the lineup) and strategies. Each week, Yu writes the playbook for the team, the larger plan that will get them from map 1 through 4 with a win. Kim, meanwhile, tries to remove what he calls “blockers” as best he can. “Sometimes, [blockers] can be a micro perspective of the game...usually what I do will be take a look into specific subjects, specific topic for two to three weeks and find a damn good answer on that,” said Kim.